Taco Tuesday is back!! Are you as excited as I am?? And I thought I’d bring it back with something a little unusal – for me, at least. While I do try meatless meals from time to time, I’m not very experimental with soy products. But when I saw these tacos, they looked too good not to at least try. When J came over and I asked him how many tacos he wanted, he asked what we were having. I told him, and with a nervous look, he said he’d try one and go from there. And he wound up eating four! He loved the roasted poblano salsa and even said the next day that when he opened up the container of salsa to fix his lunch, it made his mouth water. And I was pleasantly surprised that I really enjoyed all of the ingredients together!! Definitely a good meatless meal experience!! Add these to your next taco tuesday menu – healthy, delicious, and pretty stinkin’ easy!! Preheat your broiler and place the poblano peppers and 3 cloves garlic on a baking sheet lined with foil. Broil for 3-5 minutes, then flip the peppers and repeat. The garlic will roast more quickly, so keep an eye on it and pull it out before it burns! Once the peppers have blackened, place them in a small bowl and cover with plastic wrap. Let sit for 10 minutes, until the skin loosens from the peppers. Once it’s loosened, hold the peppers (one at a time) under cold running water and remove the skin. Next, slice the peppers open and remove the seeds before slicing into thin strips. Place the pepper strips, garlic, 1/2 cup of onions, 1/2 cup of cilantro and a squeeze of lime juice into a food processor and pulse until well mixed, but still a little “chunky”. Heat the oil in a large skillet over medium-high. Add the remaining 1/2 cup of onions and sauté until they start to soften, about 3 minutes. Add the garlic and stir until fragrant, about 30 seconds. Add the tempeh crumbles, taco seasoning and a pinch of salt and sauté for 3 minutes. Then add the remaining 1/2 cup of cilantro and a couple of good squeezes of lime juice. 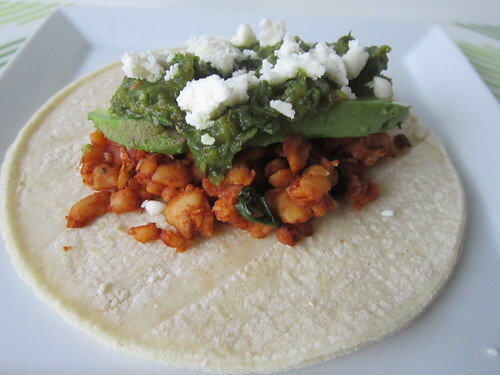 Warm your tortillas, double them up, and top with a couple spoonfuls of the tempeh mixture. Top with sliced avocado, poblano salsa, and queso fresco. Fold up those bad boys and devour! !